Some days, between the internet and the support of traveling experts, I think I could just sit in Bali and learn everything there is to learn in the world. 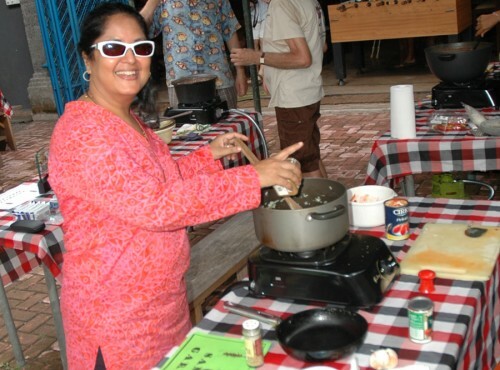 Well, maybe not String Theory or Latin, but luckily my recent pursuits are less cerebral, and richly met when a Moroccan chef with a longing for his pots and pans rolls into town, or my friend Dipika enters last Sunday’s Second Great Chili Cook-Off in Ubud with a vegetarian chili starring homemade paneer. The Great Event took place at the aptly named Melting Pot, a cavernous pool hall in the south part of Ubud, run by a warm-hearted Texan named Greg who has practically carpeted his joint’s walls with every flag known to man. I think only the borough of Queens can claim broader representation of the world’s nations and states. What’s more, the majority of them bear the signatures of their respective citizens who have passed through. I don’t care where you’re from, you’d be amazed who rocks up to our little hill town. I’m still amazed, and I’m from New York City. I stumbled upon Ubud in 1985 when my best friend was living there on a Fulbright (yes, she got paid to study the wayang gender while living in a thatch-roof house with a million-dollar view across a gorge to Mount Agung). At that time—let’s term it the long-before-Eat, Pray, Love-days—Ubud was already an established stomping ground for anthropology types, scholars, and artists, people who came to Bali to learn what and how the Balinese think, and to understand the Hindu Dharma culture and participate to the extent they were welcomed… which was a lot. While this thinking person’s village of Bali has in many ways outgrown its narrow streets, the alluring chemistry of deep local traditions and talents, blended with the creative and intellectual energy of outsiders, never seems to wear off. Five Nobel winners (including three of the peace prizers), countless authors (even ones whose books actually sell), heads of academic departments and heads of state, captains of industry, renowned yogis from India and the United States (surprise! ), choreographers (galore, its dancing Bali, remember? ), celebrities (yawn), the crew of Eat, Pray, Love (we catered it, which, yes, was really fun), and therapists of every creed you can imagine (we’re the self-help capital, haven’t you heard? ), they’ve all converged on Ubud in recent years. What do the Balinese think of all this? Who really knows? Well, I kind of do, but it’s useless for me to tell you what they think if you don’t know how they think. And you can only figure that one out for yourself. What do the Balinese think of chili? Oh, that’s easy. It’s better with rice. Line a strainer with light cotton or cheesecloth, and rest it over a deep bowl. In a heavy-gauge saucepan, heat the milk over medium high heat. When it reaches the boil, reduce heat to simmer and very slowly and very gently begin to stir in the yogurt. You want the milk to curdle, so if you wait about thirty seconds and there is no reaction, add additional yogurt, about 2 tablespoons at a time. Stir gently! 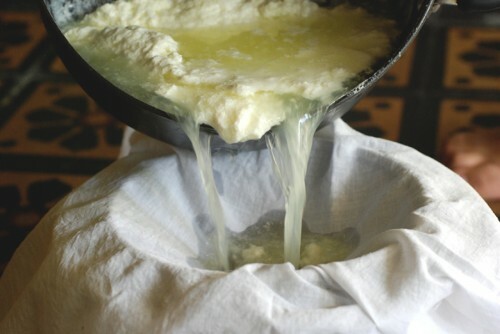 When the curds have separated and the liquid whey has turned yellowish and almost clear, as in the photo above, gently strain, reserving the liquid whey. 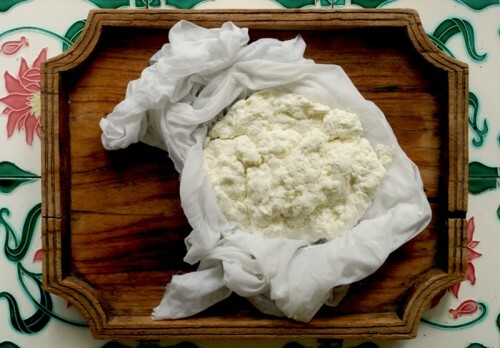 Lift the cloth off the strainer, and lay the paneer (the cheese curd) on a flat surface. If you are using it within an hour, there is no need to refrigerate. In a 4-quart (4-lt) pressure cooker, or heavy-gauge saucepan, heat 2 tablespoons of the olive oil over medium heat. Stir in the onions and cook until they just lose their pungency, about a minute, then add the garlic and bell pepper. Cook and stir until the mixture has softened, about fifteen minutes. Stir in the cooked beans, reserved whey, tomatoes, and tomato paste. If using a pressure cooker, cover and cook for about 30 minutes, or longer is you are using a conventional saucepan. Uncover, season with the chili flakes, cumin, oregano, Balsamic vinegar and salt and briefly simmer, uncovered, over medium heat until the chili has thickened into a stew. Remove from heat. When you are ready to serve the chili, heat about 1 tablespoon of olive oil in a non-stick frying pan over medium-high heat. 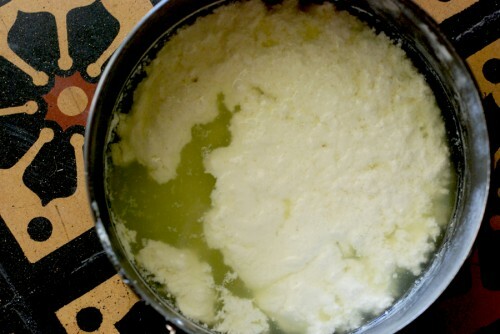 Remove the paneer from the cloth and gently slide the entire piece into the pan. When one side has browned, carefully flip it over and brown the the opposite side. Remove from heat, slice the hot, browned cheese into mouth-sized cubes and serve over the chili. Just asked Dipika for her homemade paneer recipe and here it is! ~ Shayela Cowen, February 28, 2012 at 2:30 pm. Love it, Karen!! Thanks much for highlighting the multicultural aspect of this amazing village (can we still call it that?) some of us call home. As a Texan, I am proud to say Dipika’s vegetarian chili impressed everyone with a commendable complexity and richness of flavor. Thanks for sharing the recipe. Thank you for reading and reposting. ~ Sherri Dean, February 28, 2012 at 6:41 pm. Wow! Karen, not only did I meet you today I’ve discovered your wonderful and informative blog! I’m a major foodie made to fell feel right at home when reading your blog (talk of food, recipes, mouth watering photos). I’m not sure how you find the time but thanks to all the Gods that you do. ~ Deborah Cayetano, March 3, 2012 at 5:25 pm. ~ Kitchen in Surgency, March 16, 2012 at 6:50 pm. enjoy touching base with your blog; always a new slant on food/life.pls send me your e-mail address. ~ bob eakin, March 14, 2012 at 6:52 am. Wonderful descriptions. Thanks for the tip on where to lunch in Sanur. ~ joe, April 26, 2012 at 2:20 pm.